An all-day Haitian arts and culture celebration commemorating the uprising against slavery in 1791 – Saturday, August 16th (3-9PM) – Prospect Park, Lakeside Area, Brooklyn, NY. Center for Traditional Music and Dance (CTMD) and its Haitian Community Cultural Initiative, Verite sou Tanbou, are pleased to serve as media sponsors for Bwa Kay Iman, an all-day Haitian arts and culture celebration at lakeside in southeastern Prospect Park (near the Parkside entrance), presented by Gran Bwa Culture and Neg Gran Bwa Drummers, led by Oungan Asogwe (High Priest) Deenps “Gran Bwa” Bazile. Bwa Kay Iman is a longstanding annual Haitian celebration in Prospect Park that commemorates the important slave social gathering on August 14th of 1791 that began the Haitian revolution. The event celebrates and demonstrates Haitian culture with drumming, traditional Haitian folkloric dance, artwork, and storytelling followed by traditional Haitian Vodou drumming and singing between 3PM and 9PM. CHILDREN AND FAMILIES ARE WELCOME! blankets, cushions, and lawn chairs as needed. Set up begins at 11AM – assistance is welcome! in support of this free cultural event click here. of this celebration in the park in 2010, click on the image below. Find out more about CTMD! For more information about upcoming events, what’s happening in New York City’s traditional music and dance scene, to join or to donate, go to CTMD’s website. Sunday January 19h, 2014 Haitian Vodou in Brooklyn – the roots of Haitian Vodou – the environment “four elements” – air, earth, fire, and water. (Kindly RSVP by January 18th to econdon@ctmd.org. The Center for Traditional Music and Dance and its Haitian Community Cultural Initiative, Verite sou Tanbou (formerly known as Ayiti Fasafas), invite you to “Vodou Is Nature,” an educational workshop on Haitian Vodou practice and performance in New York City. Oungan (Vodou priest) Dieudonné Jean-Jacques and Manbo (Vodou Priestess) Marie Carmel will lead a conversation discussing the roots of Haitian Vodou with respect to the environment, in its “four elements” (air, earth, fire, and water), and the Vodou spirits (lwa) which guard and represent the powerful forces and precious resources of the natural world. The conversation will be translated into English and Kreyol and will be followed by a question-and-answer session, plus a performance of traditional Vodou songs on nature themes. Audience participation is encouraged! Roots/water photo by Pam Fray, 2007 (public domain via Wikimedia Commons). Support for this program is provided to the Center for Traditional Music and Dance and Verite sou Tanbou by the National Endowment for the Arts, New York State Council on the Arts with the support of Governor Andrew Cuomo and the New York State Legislature, and New York City Department of Cultural Affairs in partnership with the City Council, Con Edison, the Emma A. Sheafer Charitable Trust, the Fan Fox and Leslie R. Samuels Foundation, the Gilder Foundation, the Hearst Foundation, the Mertz Gilmore Foundation and the Scherman Foundation. Ethanol fueled cooking stoves and briquettes can replace charcoal in Haiti and avoid deforestation. This in an effort to decrease poverty in the country. The Public-Private Alliance Foundation PPAF is promoting this project and other Green projects. January 12, 2013 will mark the third anniversary of the catastrophic earthquake from which Haiti continues to try to rebuild. The PPAF’s pilot study engaged in our Cookstove and Fuel Alternatives Initiative in Haiti. to the country. You can help make a difference in peoples’ lives. Support our work with a 2012 End-of-year tax-deductible gift to the Foundation! Click here on our website (donate buttons at top right), or send a check to PPAF, 166 Edgars Lane, Hastings-on-Hudson, NY 10706. Your participation will help bring cookstove and fuel alternatives to Haiti, as well as local jobs, better health and less deforestation. PPAF has been selected as a 2012 “Great NonProfit” because of reviews by volunteers, board members, interns and friends. Click here to go to the Great Nonprofits website to add your review. Sunday, January 6 – You are invited! The Public-Private Alliance Foundation, with support from the Community Church and others, is leading pilot projects in Haiti that are laying the basis for major changes in how people cook. Efforts are underway to meet a demand in households and small businesses to exit the poverty-disease-deforestation trap of cooking with charcoal. January – Haiti – David Stillman and colleagues will travel to Haiti to develop ethanol production and stove distribution and follow progress of the piloting of the ethanol cookstoves and briquette press. February 13 – New York City – David Stillman will report on updates to the Haiti project at the Rotary International Breakfast, 8:30 a.m. Guests welcome – $20. Your contributions make it possible for the Foundation to continue our work in bringing organizations and people together for sustainable development and clean energy. Go to our website to Like us on Facebook, join us on Linked In and receive our Twitter feeds. (1) Donate Directly. It’s quick, safe and easy to give online. Go to www.ppafoundation.org and click on the donation button you prefer. Please consider a monthly gift. You can also mail a check directly to Dr. David Stillman, PPAF, 166 Edgars Lane, Hastings-on-Hudson, NY 10706, USA. The Foundation is a 501(c)3 non-profit organization. (3) Live Green! If you live in Connecticut, Massachusettes, New York, New Jersey, Pennsylvania, Maryland, Delaware, the District of Coumbia or Illinois, you can help by changing your electricity provider to Viridian Energy. (Depending on where you live, you may also be able to switch your gas provider.) This saves money and supports green energy and a smaller carbon footprint, with the Foundation earning a small fee. Click here to learn more, and feel free to contact us. Go to www.viridian.com/PPAF or call 914-478-3450; email ppafoundation@gmail.com. You can watch a great 2-minute video by clicking at the top right on our page. (4) Volunteer, serve as an intern, or get involved as a professional. Use the information above to contact us. Israel and France sign agreement to jointly help Haiti, Cameroon, Senegal, Ghana, and Burkina Faso on food, climate change, energy, etc. Israel and France signed (September 5, 2011) a declaration of intent for cooperation in extending aid to Haiti and to emerging countries in Africa. The agreement includes joint actions in the fields of agriculture and irrigation, public health and gender. Implementation of the agreement will be through MASHAV – Israel’s Agency for International Development Cooperation, at the Foreign Ministry. Development is an important subject on the international agenda, especially against the backdrop of recent global crises (food, climate change, energy, etc. ), which mainly hurt developing countries, many of which suffer from extreme poverty and hunger. Both Israel and France view this joint activity as adding a new phase to their relationship. The Israeli-French cooperation will focus on sending experts, counseling, professional training and the like, appropriate to the needs and desires of the country receiving the aid. In the first stage, the countries designated to receive aid are Cameroon, Senegal, Ghana, Burkina Faso and Haiti. A steering committee composed of representatives from Israel and France, charged with monitoring implementation of the agreement and approving the work plans, will meet once a year. MASHAV Dep.Dir-Gen Danny Carmon (right) and HE Christophe Bigot sign aid cooperation agreement. Danny Carmon used to be #2 at the Israel Mission to the UN in New York and has long had contacts with Developing Countries’ representatives. Thanks to Israel – Is a leg amputee Salsa King from Haiti, treated by Israeli medical personnel, paying for Mr. Netanyahu’s visit to Washington, by being refused entrance to the US upon an invitation to dance today on a float at the New York Israel Parade celebrating human spirit and kindness of strangers ? On January 12, 2010, 28-year-old Gheorghes (George) Exantus, a champion salsa dancer from Port-au-Prince, found himself buried beneath rubble from his former apartment building after a horrific earthquake struck Haiti’s capital. After three hellish days, George was found by friends and dug out. Tragically, he suffered serious injuries that forced him to have his right leg amputated and his left hand treated for severe nerve damage. Thanks to miraculous medical care from teams of Israeli doctors and physiotherapists in Haiti and Israel, George begandancing again within eight months – prosthesis and all! On 5/13/11, George learned that he had been invited to participate in the Celebrate Israel Parade, Sunday, June 5, 2011, and to dance at a concert that follows. It was to be an occasion to celebrate the power of the human spirit and the kindness of strangers. It was also to be a day George would fondly remember for the rest of his life. Well, that’s the way it was supposed to be! On Tuesday, May 31st, George was at the U.S. Embassy inHaiti, being interviewed for a non-immigrant (travel) visa. Shockingly, he was denied the document. It had been determined by the interviewer that George did not have strong ties to his native country; that there was a fair chance he would stay in the U.S. for good. The decision was not overturned, despite a direct appeal by U.S. Senator Robert Menendez of NJ, and, despite the fact that articles with George’s photo had appeared in the New York Post* twice within the past four days. It would not be easy for someone of such notoriety to avoid immigration officials and remain in America illegally! George has no intention to stay in America. And, he had not asked to come here in the first place; he had been invited to come here…as an honored guest. Is this the way the greatest nation in the world treats her invitees? If President Obama were to learn about George and his rebuke, he should be mortified! The visa denial should also leave an unsavory taste with President and Secretary of State Clinton, who were invited to join George on the parade float, but declined, citing schedule constraints. Dancing was George’s life. He was thrilled to be coming to NYC to celebrate and dance at the events, and to express his gratitude to the Israelis for helping him get Back on the Floor. Why has George been denied this joy? He is able to dance again with a prosthetic leg – obtaining a visa should not be a miracle! Sunday’s parade will be broadcast live on New York TV. George’s presence could have done so much good for so many people. It could have raised renewed awareness and interest in the still-horrific situation in Haiti, 17 months after a savage earthquake killed 220,000 people and left 1.5 million homeless. It could have raised desperately-needed funds for medical treatment in Haiti. It could have alerted medical professionals to state-of-the-art equipment, therapies and surgical techniques now available to treat amputees and sufferers of severe nerve damage. It could have motivated medical personnel and others to volunteer in tragedy-stricken areas. And, George’s amazing recovery could have served as a fountain of hope for physically-challenged men, women and children in America, and beyond. How could all of this good be prevented from happening? It is too late for George to dance at tomorrow’s events, but it is not too late for him to visit America or any other country whose government officials are functioning by the basic laws of morality and common sense. Tomorrow my wife Rose will exhibit her artwork among other great Haitian artists. Traditional Haitian live music & Gene Pritsker (guitar) and I will perform our version of 3 traditional Haitian Folk songs. Great food by the restaurant KRIK KRAK. Artists living in Haiti will receive the donations. August 19, 2003 – The explosion in Baghdad that killed UN envoy, Sérgio Vieira de Mello, and three American civilians was chosen to be commemorated as World Humanitarian Day. It is appropriate to review the day in the light of unfolding Humanitarian activities in flood stricken Pakistan. subject Statement by Ambassador Rice Commemorating World Humanitarian Day 0n 8-19-10. Seven years ago, a truck bomb exploded beneath the United Nations Assistance Mission in Iraq, killing 22 people and wounding more than 100, including the UN envoy, Sérgio Vieira de Mello, and three American civilians. On this second annual World Humanitarian Day, the United States remembers the victims of the Canal Hotel bombing and others like them: citizens who have given their expertise, devotion, and, all too often, their lives providing relief for the suffering. We also recognize the growing depth and complexity of humanitarian challenges and honor the efforts of today’s brave humanitarians to meet them. On this day of remembrance, we call upon all nations and parties to assist and protect the individuals who work to provide humanitarian relief, wherever it is needed. Today in Pakistan’s flood-ravaged regions, more than 14 million people urgently need help. The United States has already provided approximately $90 million to assist Pakistanis in harm’s way. U.S. helicopters have evacuated 5,912 people and delivered 717,713 pounds of relief supplies. Still, the scale of the catastrophe defies imagination; it requires the efforts of countless humanitarians and aid organizations to assist the homeless, the hungry, and the sick. Cash contributions help these organizations meet the needs of humanitarians on the ground, and can be transferred quickly. Texting the word “SWAT” to 50555 directs a $10 donation to the UN Refugee Agency for tents and emergency aid to displaced families. At www.interaction.org, visitors may access a list of organizations accepting cash donations for flood relief. On World Humanitarian Day, the United States also recognizes the efforts of aid workers in Haiti, including those who tragically lost their lives in January’s earthquake. At once, the disaster devastated Haiti’s fragile foundations and killed many people who were best qualified to help Haitians rebuild. The expertise of the humanitarians there is indispensable. We grieve with the families of those who were lost. Across the world this year, aid workers risked great danger by responding to environmental disaster. But the United States also notes with profound alarm the rise in premeditated violence targeting aid workers – including the recent murder of ten NGO workers, six of them Americans, by the Taliban in Northern Afghanistan. Acts such as these shock the conscience and further energize efforts to defeat violent extremism, but their numbers continue to rise: from 65 victims of serious security incidents in 1999, for example, to 278 victims in 2009. In light of these terrible acts, we condemn the persistence of insidious rhetoric by political actors who portray aid workers as outsiders representing foreign interests, governments, and ideologies. As the United Nations has noted, most humanitarians come from the countries in which they work. They are inspired by the principle of impartiality that guides all aid work, and come from a variety of nationalities, ethnicities, and religious communities. We join the global community in rejecting attacks on humanitarians, and rededicating ourselves to ensuring that aid can be delivered without fear. Assistance to humanitarians is both a moral issue and a practical imperative for global security. Yet even when aid workers are buttressed by supportive national governments and parties to conflict, their work carries grave risks. Amid flood waters in Pakistan, humanitarians are called to address hardship on a scale that is nearly without precedent, and serve bravely despite facing the very same dangers themselves. On this and all days, we are grateful for their work and we honor their enduring pursuit of security, dignity, and hope for all people. UPDATE: Timberland Company is building the GREAT GREEN WALL OF CHINA. In 2001, Timberland committed to help restore the Inner Mongolia region of northern China from desertification by planting 3 million trees in China’s Horqin Desert (One Million already done!). Timberland Shoes originated in Stratham, New Hampshire, USA. Headquarters now in Portsmouth, NH. Trees also for Haiti. Originally posted August 1, 2010 and updated August 17, 2010. VELSHI: Hey, do this for a second. Take a look down and look at your shoes. You probably remember where you bought them. Where did the leather come from, or the rubber in the sole? What about the fiber in the laces or the – the cardboard of the box that they came in? Your carbon footprint could end up being a lot bigger than your shoe size, and that has become a major concern for Timberland, the company that makes all kinds of shoes and clothes and outdoor gear. Jeff Swartz is the President and CEO of Timberland. He’s joining me live from Boston. A few years ago, we spent a few days together, learning how to understand his business and what they do. Jeff, thanks for joining me. JEFF SWARTZ, PRESIDENT AND CEO, TIMBERLAND: Thanks for having me. VELSHI: You – you spent your Earth Day, yesterday, in a very interesting way. Tell us about that. SWARTZ: I was in Beijing yesterday, Ali. I spent the morning at the Great Wall. I planted with a Chinese actress named Li Bingbing. I planted the millionth tree in a project that we committed to 10 years ago to try and address the environmental damage being done in a place called the Horqin Desert. It used to be a – it didn’t used to be a desert. It is now, because economic progress leads to the destruction of forest and the result of that is sandstorms that went through Beijing and get as far as Tokyo. SWARTZ: — in the rain. And then we committed to planting 2 million more trees. We’re going to create the Great Green Wall between Horqin and – and Beijing. And so it was a – it’s a long way. I’m kind of jetlagged, but it was a pretty cool day. VELSHI: Yes, I know. And we thank you for coming out and talking to us. Listen, you are the third generation of your family in this business. Your grandfather – I think you told me he lost a piece of a – a finger, actually, making shoes back in the day, and you have melded your belief in the Earth and the environment with your business. I want to ask you, a few years ago you told me you wanted to have a carbon-neutral business. You wanted Timberland to – to be taking less from the environment than it – that it was putting back in. Where are you on that? SWARTZ: Well, we’re making big progress, and – and we have big progress yet to make, to be clear. We set a goal of being carbon neutral, and we said by the year 2010, which is now. We just — we just announced that we – last year’s result, 36 percent reduction in greenhouse gas emissions compared to the 2006 baseline. We’re on – we’re on good target to be at the 50 percent reduction place we said we’d be. It’s all very interesting, but the more time we spend on the issue, Ali, of the environmental footprint at Timberland, the more we learn about our responsibility. And so, I continue to hear our government say it can’t be done. I continue to hear critics say it can’t be done, that it’s going to destroy business if we put carbon cost into the way we run business. The fact is, we’re lowering our costs. We’re creating more innovative products. We’re doing it in a way that is environmentally thoughtful. It’s – it’s not the way of the future, it’s a reality that we’re living right now. VELSHI: I want you to tell me, there are probably three approaches for a company, right? One is that you can buy carbon offsets. In other words, you can keep polluting the way you do and buy carbon offsets. One is you can change the behavior of your company, your manufacturing processes, things like that, and the third one is you can involve your consumers in the process. You’ve done that – that last one as part of what you’re doing by putting an ingredients label on your – on your shoeboxes. Tell me about this. SWARTZ: You’re at the heart of the question. Whatever you can do by yourself unilaterally as a company, change the lighting at headquarters to LED lights, good idea, saves money. Ban bottled water at headquarters, good idea, saves plastic, but it’s a small part of the – a carbon footprint. The question’s all at the product level, and so by putting a – a nutrition label on the shoebox, we’re saying to consumers the power’s in your hands to consume. You don’t have to go hug a tree. You don’t have to do anything radical. You can get the greatest outdoor gear on earth from a company just like ours. VELSHI: So the things – some of the things you’ve got on – some of things you got on the label are use of renewable energy. Is it PVC- free, eco-conscious materials, recycled content of the box, the number of trees planted. Is this working? Do you hear from – from consumers that that helps them to make the decision to buy your shoe versus a competitor’s or your jacket versus a competitor’s? SWARTZ: Theirs is a very steady drumroll building just off camera, and it’s the sound of the consumer saying, hey, I expect more from the brands that I do business with. I hear it from government, I hear it from consumers. It is – it’s coming. It came in the food industry with organic food. It is coming in the fashion industry, and when it does, Timberland’s – not only – we want it to come, because we believe the more consumer asks about this issue, the – the better our chances of making our case to the consumer. VELSHI: Jeff, I’ve always been impressed by you, and – and we really look to you for that kind of leadership. Thank you for – for coming on the show. Thanks for what you’re doing for the environment. Jeff Swartz is the president and CEO of Timberland, joining me from Boston. All right, straight ahead, I – I want to have an honest chat with you, each and every one of you who keep me company every weekday on this show. Don’t miss my “XYZ”. Today, it’s about you. STRATHAM, N.H., USA, April 20, 2010 – Forty years ago, the first nationwide environmental protest signaled the start of the modern environmental movement. Twenty million people came together to fight the rising tide of pollution and environmental degradation and have an effect on the future of our planet. Today, Timberland stands with those, now over 1 billion strong, who share the belief that our environment is still in need of preservation, and that through the power of civic leadership, we can make a difference by participating in service events around the world on Earth Day. Timberland has recognized Earth Day with community service events for 12 consecutive years and this year, Timberland-hosted Earth Day projects will unite more than 7,600 volunteers at more than 140 service sites around the world. Timberland is sponsoring events around the globe, from New York to China and from the Dominican Republic to Madrid – generating nearly 52,000 service hours. Earth Day 2010 has additional significance as later this year, Timberland will fulfill its pledge to plant 1 million trees in China’s Horqin Desert as part of the company’s ongoing reforestation efforts. In 2001, Timberland committed to help restore the Inner Mongolia region of northern China from desertification through a partnership with Green Net. Desertification of large areas of land from population growth and overuse is a significant problem in parts of Asia, but can be reversed through the planting and sustaining of trees and shrubs, while also instructing the local population on more sustainable farming practices. This project is emblematic of the mission of today’s Earth Day: to make a difference in our environment through hard work and education. F ollowing Timberland’s Earth Day events, photos, highlights and additional coverage will be available on www.earthkeeper.com. Timberland (NYSE: TBL) is a global leader in the design, engineering and marketing of premium-quality footwear, apparel and accessories for consumers who value the outdoors and their time in it. Timberland markets products under the Timberland®, Timberland PRO®, Mountain Athletics®, SmartWool®, Timberland Boot Company®, howies® and IPATH® brands, all of which offer quality workmanship and detailing and are built to withstand the elements of nature. The company’s products can be found in leading department and specialty stores as well as Timberland® retail stores throughout North America, Europe, Asia, Latin America, South Africa and the Middle East. Timberland’s dedication to making quality products is matched by the company’s commitment to “doing well and doing good” — forging powerful partnerships among employees, consumers and service partners to transform the communities in which they live and work. To learn more about Timberland, please visit www.timberland.com. To learn more about becoming an Earthkeeper, visit www.earthkeeper.com. THE UPDATE: We have been at the Timberland headquarters in Portsmouth, New Hampshire on August 11, 2010. The location is the old Air Force base at Pease that was turn over in major part to civilian development; more on this in future postings. I got enriched by buying a great pair of tall shoes for $90 at a 40% discount, got a free cap, and learned some more about the company. The shoes are rated for green content – a very interesting new twist introduced by the shoes manufacturer. Regarding our topic of main interest the tree plantings operation – I learned that it came about because of Timberland trying to offset emissions. They picked the Horqin grasslands and desert because of their involvement in China as the source of shoes they sell. Our host was Margaret Morey-Reuner from the Department of Robin Giampa, Director, Corporate Communications. At first the company established a Committee on Grazing and Climate Change – I assume as part of the recognition that the leather production obviously means cows grazing – and eventually work started in 2001. There are 35 people from Timberland involved in this activity in the desert of Horqin. The sticker on my shoe is thus part of the offset program. Since our writing of a 3 million tree horizon for Timberland, there was further development in the program, and the company decided to work also with Haiti. Now the company horizon is 5 million trees divided between China and Haiti. I asked if the added 2 million program is all in Haiti, but our hostess did not know how the figures will divide between the two locations. Today Timberland talks of SUSTAINABLE AGRICULTURE as the underlying goal. They have a competition requiring people to describe what trees do to us in 140 characters or less. Their effort is via “Yele Haiti,” and offer you for sale a certificate of planting 15 trees in Haiti. Timberland.com handles this. They also work with an NGO from Japan – Greenland. Green Net of Japan – trees for the future. This as farming cooperative in China’s Harqin desert and Goneives, Haiti. NH’s Timberland to expand eco-friendly footwear. CONCORD, N.H. (AP) — New Hampshire-based Timberland Company is expanding its “green index” to give customers more information about the environmental impact of its footwear. The index rates the greenhouse gas emissions created during a shoe’s production, the hazardous chemicals used and the percentage of recycled, organic and renewable materials in each shoe. For now, the company rates 14 percent of its shoes but plans to expand that to 100 percent by 2012. Timberland also is working with more than 200 other businesses on an industry-wide Eco Index. Along those same lines, Nike has its own internal software tool to evaluate the environmental footprint of its products that it plans to make it available to the rest of the apparel industry. Danny Ayalon is a former Israel Ambassador to Washington DC; Now as a Member of Foreign Minister’s Avigdor Liberman Israel Beitenu Party – he is his Deputy FM. In the first meeting of its kind between the Minister of Justice of the Dominican Republic and Deputy Foreign Minister Danny Ayalon, it was decided to form a partnership and to strengthen bilateral ties so as to work together in the rehabilitation of Haiti. The plan is to establish an Israeli village that includes a school, a medical center, community centers and sport facilities, as well as the dispatch of a 14-member contingent from the Israeli police force. The Dominican Republic’s Minister of Justice said: “We are deeply impressed with Israeli capabilities in various fields. Cooperation with Israel is very important to us.” The Minister added that his country is interested in assisting with the peace process in the Middle East. Solar Street-lamps made by ENERSA became the fixed points around which refugees from the quake were able to establish camps in Haiti. A Graphic Example of The Sun As Pivot for People Who Want To Survive. The Sun Lights Up the Night in Haiti. PORT-AU-PRINCE, May 18, 2010 (Tierramérica) – There are shortages of lots of things in Haiti: clean water, arable land, trees, living-wage jobs, housing, schools, fuel, reliable sources of electricity and Internet access. But one thing Haiti has in abundance is sunny days. The sun beats down relentlessly on Port-au-Prince: on the tin and plastic roofs of the shacks in the neighborhood of Cité Soleil (not without reason named “Sun City”) and on the red tiles of the mansions in the hills in the suburb of Pétionville. Even when clouds roll in from the Caribbean, the sun heats the water droplets and turns Haiti into an enormous sauna. Haiti’s solar potential is an estimated six sun-hours in the dry season, about the same as that of Phoenix, Arizona, the sunniest U.S. city. In the rainy season it’s not much less. For the poorest country of the Americas, one with no oil, a crippling dependency on imports, and a landscape denuded in part by charcoal production, harnessing an abundant and free resource to generate power would seem a no-brainer. And no doubt this idea has occurred to many people. But it took Jean Ronel Noël and Alex Georges to turn the obvious into reality. Starting six years ago, after graduating in engineering and business administration, respectively, from Canadian universities, Noël and Georges put their heads together to find ways to bring jobs to Haiti. Thus was born Energies Renouvelables S.A. (Renewable Energies, Inc.) – ENERSA – the first Haitian company to produce photovoltaic modules and solar-powered streetlights. The idea behind ENERSA originated with a friend they had in common. His mental “light bulb” turned on while standing with Noël under a broken streetlamp. 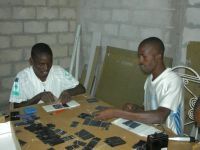 In addition to the benefits of clean energy, the two Haitian entrepreneurs hoped to employ and transfer skills to young people in a country where the jobless rate is estimated at 70 to 80 percent, and where, for those lucky enough to have a job, the minimum wage was raised last year from 1.75 to 5.50 dollars per day. The firm began as a research and development effort in a business incubator that provided a low-rent space for three years and guidance in how to run a business in Haiti. This support came from the faith-based non-governmental organisation Haitian Partners for Christian Development, located in Varreux, an industrial area of Port-au-Prince. Despite the political upheavals in 2005 and 2006 that forced them to close temporarily, in September 2009 they were able to move out on their own to their current location. The factory is a modern concrete-block warehouse with a steel frame and 930 square metres of floor space, located in the capital’s outskirts. The business, which reported just 40,000 dollars in sales in 2007, is projected to see sales totaling 2 million dollars for 2010. ENERSA sells to the government, NGOs and the private sector, but so far only in the domestic market. To date, ENERSA has installed more than 500 solar streetlamps, which run about 1,400 dollars each, in 60 towns. But their long-term target is 35,000 streetlamps in 500 municipalities. A pile of concrete rubble sits in the factory’s parking lot, a reminder of the Jan. 12 earthquake that wreaked havoc on Port-au-Prince and surrounding areas, leaving a death toll of more than 220,000 and damages worth 7.8 billion dollars. One exterior wall of the warehouse and all of the interior rooms, which had been built of concrete block, were destroyed. But all of the employees survived unharmed. Despite the destruction, many of ENERSA’s streetlamps shone through the night. “People formed their own refugee camps around those streetlights before the outside aid groups ever showed up,” Richard J. Komp of the U.S.-based Skyheat Associates, told Tierramérica. Komp is a global expert in solar energy who mentored Noël and Georges. Three months after the quake, ENERSA had risen from the ashes, rebuilding the factory, and once again producing solar streetlamps – and now looking to expand the products the company offers. ENERSA’s 22 employees are mainly young men from nearby Cité Soleil. Most of them have had little schooling, so Noël and Georges train them for several weeks in technical skills. Without these jobs, Noël says, their most likely alternative for making a living would have been to join a gang and sell drugs. According to Noël, ENERSA is the only firm that manufactures solar streetlights in Haiti, although two other firms distribute them here. Steel tubing and sheet metal for lamp poles and mounts are sourced from Haitian suppliers, along with any other parts they can find domestically. Komp trained the ENERSA staff how to manufacture their own photovoltaic modules, the solar panels mounted on rooftops that convert sunlight to electricity. The firm has to import the components from the United States. ENERSA also builds its own simple inverters, devices that control the voltage for cell-phone charging circuits. A recent innovation is a box with electrical outlets, mounted near the bottom of the streetlamp post. There, people can recharge their cell phones, which are ubiquitous in Haiti. Last Christmas, ENERSA gave motorcycles to four of its outstanding employees. Now they are circulating through Cité Soleil as proof of the possibility of making a decent living at a good job in Haiti. From the Armin Rosen IPS reporting from the UN, April First 2010 – Donors Pledge $15 Billion in Aid to Haiti, reminding us that pledges are easy but fulfilling them is harder. We learn that while the US pledged $1.25 Billion, Venezuela pledged $2 Billion – both Clintons are in the lead. To that end, the U.S. pledged 1.15 billion dollars towards “supporting the government of Haiti’s plan to strengthen agriculture, energy, health, and security and governance.” Other major donors include Venezuela and the Inter-American Development Bank, which each pledged around two billion dollars over the next decade. Haitian Prime Minister Jean-Max Bellerive said the government devised its own redevelopment framework after producing a post-earthquake needs assessment report. According to Bellerive, that plan entails major investment in basic infrastructure along with the short-term reconstitution of the Haitian government, which lost all of its ministry buildings and a quarter of its civil service in the January quake. Former U.S. president Bill Clinton, who will co-chair the interim redevelopment committee with Bellerive, was candid in discussing the shortfalls of previous approaches to international development in Haiti, and struck a self-critical note in discussing his pre-quake work as a U.N. Special Envoy, a position he has held since May 2009. “I was asked…to harass all the donors to see that they honour their commitments. I was a failure at that,” he said, noting that only 30 percent of the funds requested for development in Haiti before the earthquake had actually been dispersed. The rebuilding process is still fraught with uncertainty, largely because of the possibility that the international community will not follow through on its commitments. Marc Levin, a professor of sustainable development at Columbia University’s Earth Institute who was in Haiti in the period immediately after the earthquake, told IPS that the rebuilding process will have to play out before the conference can be considered a success. He cited the Marshall Plan, the U.S. government’s programme for restructuring European economies and governments after World War II, as a model for the kind of comprehensive, far-reaching redevelopment that will be needed in Haiti. While the future of the redevelopment efforts remains murky, Wednesday’s conference offered more occasions for optimism than pessimism. Marie St. Fleur, Massachusetts’s first Haitian-American state legislator, received one of the day’s largest ovations for a speech about how the rebuilding process could give Haitians the opportunity to take responsibility for their nation’s future. “It is up to us to help make real the hard won freedom that the fathers of the Haitian Revolution fought so valiantly for,” she said, referring to the 1804 slave uprising that made Haiti the Western Hemisphere’s second independent state. Poverty, rather then the Richter Scale, is a way to predict the scope of damage from an earthquake. A lack of building codes contributed to the devastation a Jan. 12 earthquake caused in Port-au-Prince, Haiti whereas Chile — a wealthier nation — escaped a more powerful earthquake Saturday with far less damage. Though an 8.8-magnitude earthquake that rocked Chile early Saturday was one of the strongest on record, the structural devastation and human toll is expected to be far smaller than the 7.0-magnitude earthquake that struck Haiti in January. To project the scope of destruction and loss of human life, the quality of buildings and the poverty level are far more telling than the magnitude on the Richter scale, scientists and aid workers say. “It’s not as much the earthquake that kills, it’s the poverty that kills,” said Colin Stark, a geomorphologist and researcher at Columbia University’s Lamont-Doherty Earth Observatory who is studying the aftermath of a 1999 earthquake in Taiwan to predict the probability of landslides in Haiti. In 1999, earthquakes of similar magnitudes struck Taiwan and Turkey, but Turkey, which has a higher poverty level, experienced five times as much damage, according to Stark. “The thing ultimately that decides how much damage there will be and how many people die is the quality of the buildings,” he said. Mexico City, built on a lakebed, proved particularly vulnerable in 1985 when a 8.1-magnitude earthquake killed about 10,000 people and toppled more than 400 buildings. The depth and proximity of the earthquake’s epicenter to cities also determine the level of damage, said Robert Williams, a geophysicist for the United States Geological Survey in Golden, Colo. “The Haiti quake occurred very close to some densely populated areas. In Chile, by the time the energy reached the capital, it had dissipated a little bit. Also the Chile quake was deeper, so the energy was attenuated as it rose to the surface,” said Williams. The epicenter of Saturday’s earthquake was 385 miles southwest of Santiago, but the tremor toppled historic buildings in the capital and resulted in the death of hundreds of people. of Latin American and Caribbean leaders in Mexico last week. Aid workers from Seattle-based World Vision were dispatched Saturday afternoon on the first relief flight to Chile, though the damage was not expected to rival the destruction in Haiti. “World Vision is concerned about those living near the epicenter who are poorer and more marginalized in Chilean society, and of course children. But it would be difficult to imagine us seeing anywhere near the death toll or damage that we’ve seen in Haiti,” spokesperson Rachel Wolff said. A country’s experience and preparedness also lower fatalities in a natural disaster, Wolff said. Chile sits in the “ring of fire” earthquake zone around the Pacific Rim, and it has a long history of earthquakes, including the strongest on record which struck in 1960, a 9.5-magnitude quake that struck near Validvia and left 1,655 dead. In Haiti, the severity of destruction and the high number of deaths were a function of the nation’s extreme poverty, lack of building codes and inexperience with earthquakes, Wolff said. Chile, by comparison, has strong building codes based on experience with large and fairly regular earthquakes. The nation’s average annual income is $11,000, compared to $1,900 in Haiti. Wealthier earthquake-prone areas like San Francisco invest in buildings that will withstand disaster, Stark said. Poor nations have little hope of constructing homes and office buildings that meet such high standards, he said. “For many of the poor inhabitants, indeed, they will never be able to afford to construct buildings as they do in San Francisco, but that shouldn’t be the goal,” said Marc Eberhard, a University of Washington civil and environmental engineering professor who led a five-person team that provided engineering support to the United States Southern Command in Haiti. The earthquake in Chile was far stronger than the one that struck Haiti last month — yet the death toll in this Caribbean nation is magnitudes higher. Chile is wealthier and infinitely better prepared, with strict building codes, robust emergency response and a long history of handling seismic catastrophes. No living Haitian had experienced a quake at home when the Jan. 12 disaster crumbled their poorly constructed buildings. And Chile was relatively lucky this time. Saturday’s quake was centered offshore an estimated 21 miles (34 kilometers) underground in a relatively unpopulated area while Haiti’s tectonic mayhem struck closer to the surface — about 8 miles (13 kilometers) — and right on the edge of Port-au-Prince. “Earthquakes don’t kill — they don’t create damage — if there’s nothing to damage,” said Eric Calais, a Purdue University geophysicist studying the Haiti quake. The U.S. Geological Survey says eight Haitian cities and towns — including this capital of 3 million — suffered “violent” to “extreme” shaking in last month’s 7-magnitude quake, which Haiti’s government estimates killed some 220,000 people and left about 1.2 homeless. Chile’s death toll was in the hundreds. By contrast, no Chilean urban area suffered more than “severe” shaking — the third most serious level — Saturday in it’s 8.8-magnitude disaster, by USGS measure. The quake was centered 200 miles (325 kms) away from the capital and largest city, Santiago. In terms of energy released at the epicenter, said Calais, the Chilean quake was 900 times stronger. But energy dissipates rather quickly as distances grow from epicenters — and the ground beneath Port-au-Prince is less stable by comparison and “shakes like jelly,” says University of Miami geologist Tim Dixon. Survivors of Haiti’s quake described abject panic — much of it well-founded as buildings imploded around them. Many Haitians grabbed cement pillars only to watch them crumble in their hands. Haitians were not schooled in how to react — by sheltering under tables and door frames, and away from glass windows. Chileans, on the other hand, have homes and offices built to ride out quakes, their steel skeletons designed to sway with seismic waves rather than resist them. “When you look at the architecture in Chile you see buildings that have damage, but not the complete pancaking that you’ve got in Haiti,” said Cameron Sinclair, executive director of Architecture for Humanity, a 10-year-old nonprofit that has helped people in 36 countries rebuild after disasters. Sinclair said he has architect colleagues in Chile who have built thousands of low-income housing structures to be earthquake resistance. In Haiti, by contrast, there is no building code. Patrick Midy, a leading Haitian architect, said he knew of only three earthquake-resistant buildings in the Western Hemisphere’s poorest country. Sinclair’s San Francisco-based organization received 400 requests for help the day after the Haiti quake but he said it had yet to receive a single request for help for Chile. “On a per-capita basis, Chile has more world-renowned seismologists and earthquake engineers than anywhere else,” said Brian E. Tucker, president of GeoHazards International, a nonprofit organization based in Palo Alto, California. Their advice is heeded by the government in Latin America’s wealthiest nation, getting built not just into architects’ blueprints and building codes but also into government contingency planning. “The fact that the president (Michelle Bachelet) was out giving minute-to-minute reports a few hours after the quake in the middle of the night gives you an indication of their disaster response,” said Sinclair. Most Haitians didn’t know whether their president, Rene Preval, was alive or dead for at least a day after the quake. The National Palace and his residence — like most government buildings — had collapsed. Haiti’s TV, cell phone networks and radio stations were knocked off the air by the seismic jolt. Col. Hugo Rodriguez, commander of the Chilean aviation unit attached to the U.N. peacekeeping force in Haiti, waited anxiously Saturday with his troops for word from loved ones at home. He said he knew his family was OK and expressed confidence that Chile would ride out the disaster. Calais, the geologist, noted that frequent seismic activity is as common to Chile as it is to the rest of the Andean ridge. Chile experienced the strongest earthquake on record in 1960, and Saturday’s quake was the nation’s third of over magnitude-8.7. On Port-au-Prince’s streets Saturday, many people had not heard of Chile’s quake. More than half a million are homeless, most still lack electricity and are preoccupied about trying to get enough to eat. Fanfan Bozot, a 32-year-old reggae singer having lunch with a friend, could only shake his head at his government’s reliance on international relief to distribute food and water. The Latin Nations of the Western Hemisphere try to unite and discard the old world and the US and Canada infringement on what they see as their territory. It all started with the ALBA group. The Latin Nations of the Western Hemisphere try to unite and discard the old world and the US and Canada infringement on what they see as their territory. It all started with the ALBA group. The US might try now to mend its ways with Cuba, but the UK is out for confrontation because of Antarctic oil. The US will have to take position when this issue reaches the Security Council. What if Argentina offers China rights to drill in the same areas that they consider part of their territorial waters? We keep saying – the US will find it difficult to continue with wars in Asia if its backyard “south of the border” gets shaken up. Subject: Weekly Roundup: Latin America’s New Bloc. Argentina brings its dispute over drilling in the Falklands to the UN, Brazil and Mexico move on FTA, and Mayans celebrate 5126. Read these stories and more in the Weekly Roundup. 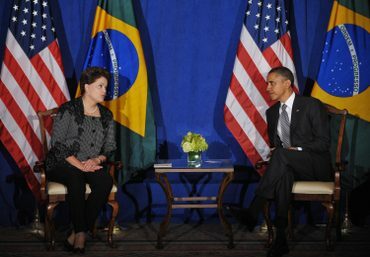 Leaders at a Rio Group summit proposed a new regional bloc that would exclude the United States and Canada. The Dominican Republic rallied to help neighboring Haiti after last month’s devastating earthquake. But Dominican concerns over refugees crossing the border could strain relations. The Weekly Roundup summarizes editorials, blogs, and analysis for an overview of news about the Americas. The US faces great danger in Haiti if it does not start to negotiate with Latin America and Central America so that BRAZIL takes over the lead role in HAITI. Obviously – US money will be required for rebuilding but let someone else be in charge after the initial US military help in the distribution of food. International relief organizations backed by American soldiers delivered hundreds of tons of rice to homeless residents of the Haitian capital Sunday, laboring to ease a food shortage that has left countless thousands struggling to find enough to eat. But even as food-aid workers enjoyed their most successful day since the Jan. 12 earthquake, the increasingly prominent role of U.S. troops and civilians in the capital is creating high expectations that the Obama administration is struggling to contain. The needs are extraordinary, and the common refrain is that the Americans will provide. But help has its limits, U.S. officials emphasize in their public statements and in their interactions with Haitians. “You will have a friend and partner in the United States of America today and going forward,” President Obama said the day after the earthquake. But U.S. officials here make it clear that the American government is not responsible for rebuilding the ravaged country. “The military forces . . . are not here to do any reconstruction. That is not our mission,” said Col. Rick Kaiser, a U.S. Army engineer overseeing emergency repairs to the Port-au-Prince docks, the electrical and water systems, and other battered infrastructure in the hemisphere’s poorest country. Administration officials, including Secretary of State Hillary Rodham Clinton, describe virtually every activity here as “Haiti-led,” although the government is barely functioning and its record was checkered even before the earthquake killed more than 110,000 people and leveled an array of government ministries. Louis Lucke, the senior U.S. Agency for International Development official in Haiti, stood in an American-run medical complex Saturday with President René Préval and told reporters that “the Haitians are leading the process in all the areas that are necessary” — including food distribution, despite strong evidence to the contrary. U.S. officials are doing what they can to bolster the stature of Préval and Prime Minister Jean-Max Bellerive and to promote international assistance efforts for the more-daunting work that lies ahead. In the meantime, they are deploying personnel to support projects from food delivery to the erection of a temporary hospital near Port-au-Prince. Sgt. 1st Class Jason Jacot, an Army engineer, drove to a critical power station in the Delmas neighborhood Sunday morning to assess repairs made by Haitian and Dominican workers. U.S. soldiers, whose numbers within Haiti have risen to 6,500, played a central role in Sunday’s food distributions, working alongside U.N. peacekeepers to prevent the pushing, shoving and occasional melees that have severely hampered deliveries. Where U.S. troops have been present in recent days, relief workers say, deliveries have gone smoothly. By day’s end, the U.N. World Food Program calculated that roughly 400 metric tons of rice had been delivered to nine sites. Five more locations will be running early in the week, a spokesman said, but increased gang violence in the Cité Soleil slums made deliveries too risky. The generally smooth deliveries on Sunday, based on a new system of ration cards, were met with pleasure at the Place du Canape Vert, an impromptu settlement where several hundred families received large sacks marked “Product of USA” or “USA Best Rice.” Yet some asked when there would be something more than rice, while others wanted to know why they were left out. Deliveries will resume Monday as the World Food Program, bolstered by an $80 million U.S. contribution, seeks to reach 2 million people in the next two weeks. The agency hopes the system will lead to distribution of other badly needed food and relief supplies. At the ramshackle encampment, some residents were boiling water for rice within an hour of the delivery. Some had beans or root vegetables to add, and a few had meat. Those who could afford neither complained that rice alone would not be enough. A throng of people in the square discussed their lack of faith in Haitian authorities. One after another, they said their only hope is the United States. 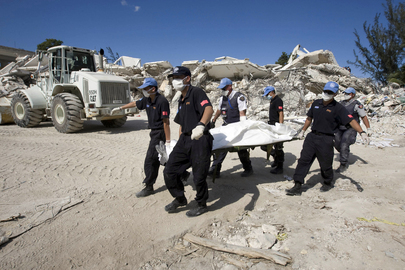 In Haiti, Chinese Team Came, Dug Up Its Own Single Victim Who Happened to Visit The UN Mission When the Earthquake Struck, then Left as Fast As They Came. Seemingly the Word Taiwan Scared Them Off. China is this month’s UN Security Council President. We learned from Matthew Russell Lee reporting from the UN in New York about China’s deeds in Haiti. UNITED NATIONS, January 27 — UN peacekeepers have been firing tear gas and, according to eye witnesses, rubber bullets at Haitian aid seekers. Meanwhile, the UN confirmed on Wednesday that the Chinese search and rescue team which appeared so quickly in Haiti left just as quickly, as soon as it recovered the bodies of its own national who had been visiting the UN Mission, MINUSTAH. Wimhurst remained silent when asked to explicitly confirm that the Chinese search and rescue team left immediately after digging out its own national. But when asked twice to name a single other place in Haiti where the Chinese team had dug, he could not. “They went back to China,” he said. Video here, from Minute 10:02. But on January 28, Chinese diplomats told Inner City Press to check with John Holmes, who they cited as on record about additional Chinese work in Haiti — a country with whose government China has no diplomatic relations, since Haiti recognized Taiwan. Inner City Press asked Holmes to square this with what Mr. Wimhurt said. “I don’t know what to add,” Holmes said. “That’s my understanding, the Chinese information as well.” But was he a witness? Video here, from Minute 15:34. A President – Not A Prime Minister. The pre-State-of-the-Union Sunday on US TV gave us lots to brag about. Much that was said was similar to our position. They called to President Obama to stop acting like a Prime Minister and start rather be Presidential by using the legal powers in his hands. The pre-State-of-the-Union Sunday on US TV called to President Obama to stop acting like a Prime Minister and start rather be Presidential. – but Obama did not manage to get any Republicans to his side. the immediate crisis is gone – people will go home and what then? international partnership of Haiti. WE NEED LATIN AMERICA AND CENTRAL AMERICA PARTICIPATION. time – BRAZIL COULD BE INVOLVED. society – I took this as a nod to the Voodoo culture. the Iraq and AfPak regions and we must focus there. In Haiti we must create a Nation State – this is a Nation Building issue, but Haiti is not the Germany of 1945. A Marshall plan is a huge commitment and Dominique Strauss-Kahn of the IMF talks of reviving a viable economy &quot;with people building and selling.&quot; He says the Haitians must be in the driver’s seat. Calls for US, French, Canadians involved. Edmond Mulet – the French Guatemalan in charge of the UN in Haiti, after the previous French speaking Tunisian leader died in the earthquake, was also brought to the program, but this segment seemed rather like a call back to the old ways of the UN and the US. I missed there the Latin and Central American true angle, and the evolution of Brazilian leadership – the Brazilians having lost more people in Haiti then other foreigners except the American citizens of Haitian origin. The US was also mentioned in regard to the TPS status that will be allowed for those in the US illegally now – so they surface for an 18 months legal status that allows the closing of the borders for next push by Haitians. Edwidge Danticat, a successful Haitian-American writer from Miami, was brought to the Program – this as evidence of Haitian success when free to compete and unleash their talents, though fully aware of their close family having undergone oppression back home and here in the US. she Spoke of family loss in Haiti. (Republican State) are not safe – it is an Independent Vote that wins! introduce the bill – we do not see his legislative genius in action. because of the squabbling in congress. transformational – we need this! same direction with the people – that is why he succeeded better. required reading in this White House. others might do this to you also. We say – if they do not really become part of a Climate Change agreement- what is there to hold the rest of the world back from changing WTO rules so there are carbon taxes at the border?